Metro North Mall, a Northland staple for decades since opening in 1976, is weeks away from the wrecking ball. That’s what Spencer Thomson, representing the developer IAS Partners, said. Thomson, a Northlander who also grew up coming to Metro North like so many others, walked 41 Action News through what now looks like a shell of what shoppers remember. Salvage crews have been busy removing everything they could use. Piles of rubble sit lit by skylights while empty department stores sit eerily dark. Water damage caused the ceiling to collapse inmac one portion, allowing animals to make their way inside. Even though the mall was just about pristine when it closed for good in April 2014, Thomson said it is time for this building to come down. “Everything you see we will recycle in some way, shape, or form,” he said. Like so many malls in Kansas City and across the country, Metro North is full of decades of memories for the people who spent a lot of time here like I did growing up. Whenever you ask someone what they remember, a few favorites are always included. I always remember grabbing a strawberry orange Julius while I was shopping with my mom and sometimes I’d get to ride the train. Deb Hermann remembers taking her kids. Hermann, a former city councilwoman now with Northland Neighborhoods Inc., remembers seeing several plans for Kansas City malls come through and fall through. “It is tough, I think it is very tough,” she said. But the developer behind the new Metro North Crossing has already tackled two Kansas City mall renovations at Blue Ridge and Antioch. Hermann remembers when the Antioch plan came through. With such a nostalgic place in the balance, she said the neighborhood was also anxious about making the right change. Hermann said she is happy with the finished development that has spurred other development right around it from an incoming restaurant to a fitness center to new facades on other nearby stores. In recent years, several other long dilapidated Kansas City malls have started to come down. Thousands of Cerner employees will work where Bannister Mall once stood. Developers expect to start demolishing Metcalf South by the end of the year. Plans for a redevelopment include a Lowe’s store. Demolition doesn’t necessarily guarantee a future. 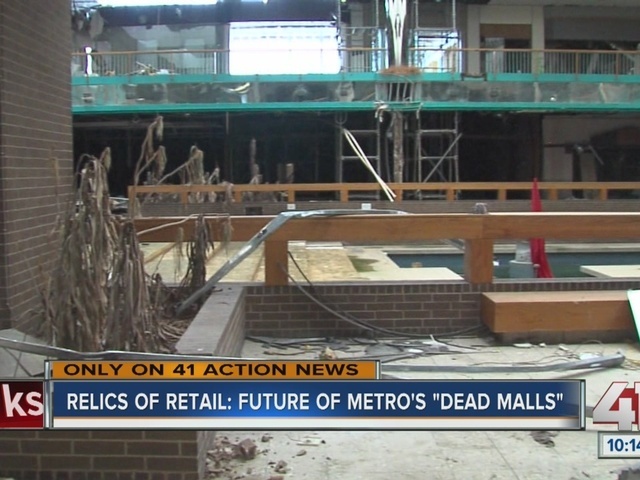 Both the Great Mall of the Great Plains and Indian Springs are in stages of demolition. Neither has concrete redevelopment plans just yet. The old Mission Mall was torn down about a decade ago and the site still sits empty. There is a plan and a developer but the Mission City Council rejected the latest version of that plan last month. Many developers we talked to agreed that a combination of changing shopping habits (like shopping online) and the recent recession helped to kill many malls. Several developers also said the market finally coming back could be part of the reason the mall locations are coming back to life too. “The real estate is still good real estate,” said Thomson. He points to another catalyst for Metro North’s renaissance. He said Kansas City’s Twin Creeks development and its expected population boost in the years to come means more potential shoppers living in the neighborhood. The plan brings roads, sewers, and more to thousands of acres nearby and is expected to bring tens of thousands of new residents. Meanwhile, people like Pamela Moore are still shopping at the Macy’s and said they will shop at the new Metro North Crossing too. In fact, Macy’s is the only anchor store confirmed at Metro North Crossing. The new development will look much different than the new Antioch or Blue Ridge. Click here to see renderings for what Metro North Crossing could look like. The developer hopes tenants will include a specialty grocer, health club, hotel, residential space, and more stores and restaurants. The existing Olive Garden, Red Lobster, and McDonald’s in front of the mall will stay. The main entrance will stay off of Barry Road, but now you will be able to essentially drive down the middle of what used to be the mall. Shops will face that main road. Thomson said they are close to a deal with a theater tenant and believed once the wrecking ball hits, more tenants will follow. He hopes that’s when neighbors start to get excited too. Lindsay Shively can be reached at lindsay.shively@kshb.com .